Finally typed up something that was supposed to be a concise history of Rocky and diabetes, but it's more like “War and Peace”.....please only use the bits that you need!!!! Rocky is a (large!) 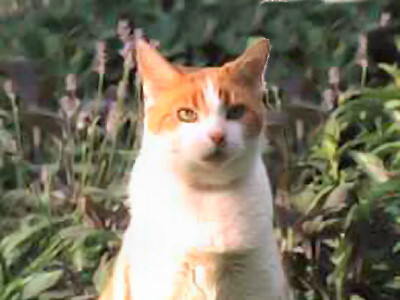 ginger and white male short hair, 12 years old, birthday round about end of March. Rocky was diagnosed end of November 2000 after taking him to the vets due to urinating in the house, weight loss, weak back legs (classic example, really) and he needed a dental. Urine check, spot glucose and fructosamine confirmed the diagnosis. Advised not to have dental surgery done until his blood glucose levels were more stable. Started on PZI, two units once daily. We weren't home testing and were relying on vet curves and spot blood tests. Hadn't read anything about home testing at all, didn't even know you could do it. His dose was raised too quickly and too often and very soon he was rebounding badly. Finally he was on eight units PZI once daily. After much searching on the Internet and huge amounts of reading, we started home testing him the following March and discovered he was in chronic rebound (Somogyi effect). Cut his dose right down, worked up slowly with full glucose curves each time, but still never managed to achieve any kind of control. He finally had the dental and lump removed (which turned out to be an encysted haematoma) in February 2001. We changed him over to the wet Waltham Renal Support food and the Hills dry KD biscuits. The vet wanted to see how he did on this before starting subcutaneous fluids. She was also worried about the Ultralente not keeping him in a tight enough range especially considering his kidney issues. So, in a move that was prompted by necessity, we changed his diet and insulin in one fell swoop. Not recommended normally, I know. Started him on bovine Lente twice daily. Results were good; he gave us consistent, predictable numbers. Curves also very promising, Lente certainly did what Ultralente didn't. He went back each month for three months to have his kidney values checked. Amazingly, even after the first month the values had come right down and they continued to decline on subsequent checks. Vet check-up on kidneys - values had deteriorated. Very poor fructosamine, 608. Curve done on 2.5 units and vet not happy with the insulin's duration. Had tried upping to 2.75 but peaking too fast and too low. Decided to try PZI again, but twice a day this time. Started him on 2.5 units. Fingers crossed! Weight up to 7.4kgs. All spot checks on PZI twice daily in high range. First PZI twice daily curves reviewed by new vet - not happy, Rocky is rebounding again. Too much duration for twice daily. Recommended we went back to once a day, which we did. Started 2 units daily. Have worked up very slowly to four units a day. Duration is almost 24 hours, but the hope is we can keep him in a good range for the bulk of the day/night. With increased doses, duration has increased. Peak has moved further on to hour 10-12. Feeding times modified, dinner now at Hour 8 rather than Hour 12 helped pre-shots. No dry food at night! Last few kidney checks have shown values worsening again. Vet started him on Fortekor (ACE inhibitor) early May. Straight away all glycaemic control went out the window! Have tried upping insulin dose, still not keeping him in a reasonable range. Started doing daily subcutaneous fluids beginning of May. Helped with hydration, but constipation becoming a problem. Started on Lactulose, which has been helpful. Also seeing the occasional dry vomit session, usually at night. Started quarter of a Pepcid AC tablet as needed, and haven't seen any more vomiting attacks. Have also decided that he isn't getting duration on PZI, so are starting twice a day regime again. Still eating pretty well but he has lost weight. Could be a good sign! From 7.4 kilos in January to 6.8 kilos in May. After first month on Fortekor, saw biggest increase in creatinine so far. BUN stable. After nearly two months, I took him off it, as I couldn't see any positive benefits. Off the Fortekor and onto twice a day with PZI. Glycaemic control almost back on track again. Kidney values slightly worse again, but BUN down, due to better hydration. Rocky has started monthly anabolic steroid (Laurabolin) and B-complex shots to build him up. Weight stable at 6.8kgs. Generally very perky, eating well, going out and doing cat-stuff. Vet pleased with him. Rocky suddenly stopped eating - turned out to be his teeth. Had a much needed dental! Isofluorane gas, vet very skilled, Rocky was fine. Removed two upper canines and one lower incisor - really rotten and needed to come out. Weighed in at 6.2kgs but had lost most of this in the 2 weeks prior to the dental. Had another kidney check, creatinine had dropped quite dramatically, from high in July of 459 down to 274. BUN about the same.